An update to Flight VA241 from Arianespace reveals that both of the spacecraft launched on Flight VA241 — SES-14 and Al Yah 3 — have now been acquired and are operating in orbit nominally, despite a trajectory deviation experienced during the mission. This information was confirmed by the satellites’ operators, SES and Yahsat, respectively. Liftoff occurred as planned at 19:20 local time in Kourou on January 25, 2018. At H0 + 9 min. 26 sec., ground tracking stations lost contact with the Ariane 5 launcher. Initial investigations show that the situation resulted from a trajectory deviation. SES-14 and Al Yah 3 were separated from the launcher on a stable orbit. Arianespace has set up an independent enquiry commission in conjunction with ESA. The upcoming launch campaigns currently underway at the Spaceport in French Guiana are proceeding as scheduled. Original story: According to Arianespace, a few seconds after ignition of the upper stage, the second tracking station located in Natal, Brazil, did not acquire the launcher telemetry. This lack of telemetry lasted throughout the rest of powered flight. Subsequently, both satellites were confirmed separated, acquired and they are on orbit. SES-14 and Al Yah 3 are communicating with their respective control centers. Both missions are continuing. 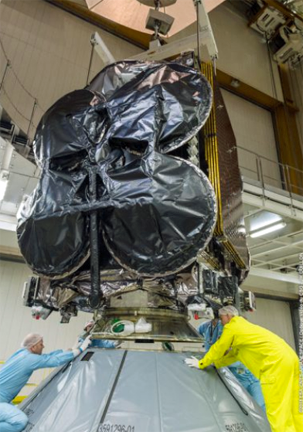 The Al Yah 3 satellite being installed atop Ariane 5’s core stage inside the Spaceport’s Final Assembly Building. Encapsulated in the ogive-shaped protective fairing, SES-14 was positioned atop Al Yah 3, which was installed on the launcher’s cryogenic core stage inside the Spaceport’s Final Assembly Building for Ariane 5. Ariane 5 delivered a total payload lift performance of more than 9,100 kg. during the mission — this combined mass factors in the SES-14 and the Al Yah 3, as well as the launch vehicle’s dual-passenger dispenser system and satellite integration hardware. This mission is designated at Flight VA241, marking the 241st flight using an Ariane vehicle since this European series of launchers entered service in 1979. It kicks off another busy year of activity for Arianespace, which has the objective of performing as many as 14 missions in 2018 with its full launcher family — consisting of the heavy-lift Ariane 5, medium-lift Soyuz and lightweight Vega.